The Attorney General’s Office is renovating its existing properties and building new facilities at the Pastore Government Center in Cranston, Rhode Island, to enhance functionality and efficiency. The new single story facility (with a partial basement) will house a Customer Service Center. 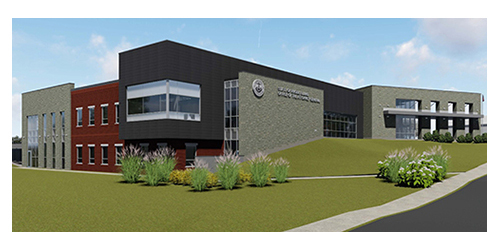 The three (3) primary occupants for the new facility include; the Bureau of Criminal Investigation Unit (BCI), Adult Diversion Unit, and the Consumer Protection Offices. The project includes construction of an approximately 26,600 GSF Attorney General Customer Service Building. The building and associated parking areas are located at Pastore Center on the corner of Pontiac Avenue and Howard Avenue. The building program includes employee offices, conference rooms, and administrative spaces. A basement (approximately 7,600 GSF) is included for future expansion and building support services. There is an employee parking lot with 40 spaces and a visitor’s parking lot with 80 spaces to accommodate the new building. There are two bus parking spaces and two police officer parking spaces provided. The project also includes site utilities and site development related to the building. The Owner is planning for LEED Silver certification.